Why People Stay Home When A Hurricane Is Coming As rescues continue after Hurricane Michael, officials expressed frustration at people who didn't evacuate. But experts say people's decisions to stay are almost always carefully considered. 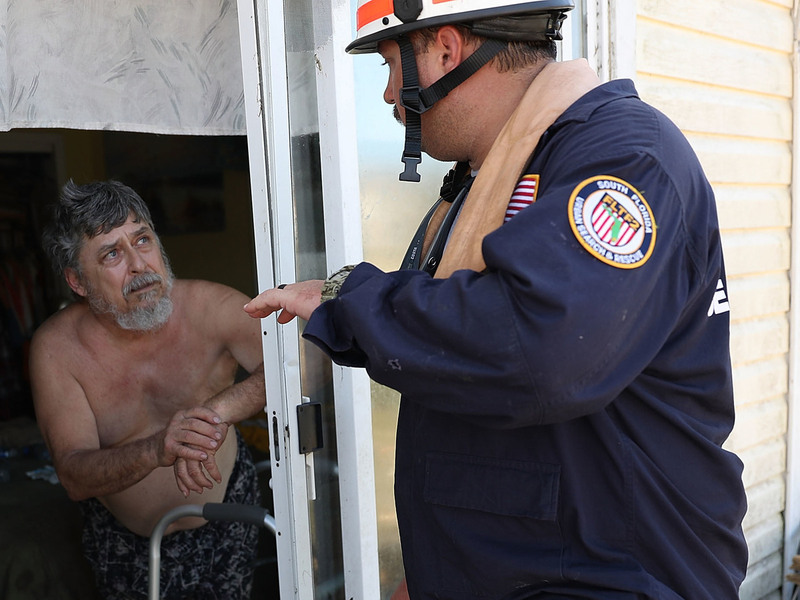 Brian Bartlett from the South Florida Search and Rescue team checks in on Tom Garcia, who stayed in his home through Hurricane Michael. Experts say people's decisions to stay are almost always carefully considered. "Unfortunately in this country we seem to not learn the lesson," Long said, his exasperation audible as he spoke to reporters a few days after the storm. "When we ask people at the local and state level to heed the warnings, dang it, do it! Get out!" More than a week since Michael ravaged the Florida Panhandle, officials say many people still are unaccounted for. Some could be buried under the crumbled homes they refused to leave. Experts who have studied the reasons people choose to evacuate — or to stay put — say while Long's frustration is understandable, the reality is often far more complicated. "It's easy when you're on the outside," said Cara Cuite, a Rutgers University researcher who has studied the evacuation decisions people made during Hurricane Sandy in 2012. "Of course it's, 'Get out.' But when it's your life and your home, it's often a lot more challenging than that. It's not as simple and straightforward as it might seem." Some of the reasons people decide not to evacuate can be easy to understand. Others are counterintuitive. But experts say people's decisions are almost always rational ones, made after having considered the costs and benefits. Appreciating the full complexity of that calculus is important, experts said, if emergency managers hope to convince as many people as possible to get out of harm's way before it's too late. To do this, officials and researchers are finding new ways to encourage people to evacuate — from helping residents visualize the potential storm surge to mobilizing more efficient transportation and better communicating resources available. For a family of four without nearby relatives, a seven-day evacuation — including hotel, fuel, and food — can cost upward of $2,000, said Joshua Behr, whose research team at Virginia's Old Dominion University has surveyed thousands of people since 2011, when Hurricane Irene threatened the state's southeast coast. "Many modest- to low-income households simply don't have the cash or credit," he said. "When they return home they have difficulty paying the rent or mortgage." Those with the fewest means often wait the longest to evacuate. By the time they do, the cheapest hotel rooms are gone, and the more expensive ones are even farther away. "When you go through that cycle once or twice, you're more skeptical," Behr said. "There's a sense of storm fatigue. You tend to wait and see." Many people have told Behr's researchers that they saw hurricanes as an opportunity to boost their incomes. "There's often an opportunity to make extra cash," Behr said. Some get a side hustle, like clearing debris from people's yards. Others — especially those working in service and construction industries — feel like they have no choice. "Many folks are employed in auto repair, roofing, remodeling, siding," Behr said. "And many employers told them, 'When this storm passes, I need you to work 16 to 18 hours, and if you leave and can't get back in, you'll be out of a job.' Those people stay." Pets. Concern for elderly neighbors or relatives. A medical regimen. Those are all reasons people decide to hunker down rather than evacuate. In these cases, policies and the messaging around them are important. "Certain populations won't evacuate for fear of personal property," Behr said. "For those households, messaging that informs them that protective services will be staged close to their properties may lessen their concerns. For those fearful of disruption to their medical regimen, letting them know there are medically friendly shelters." The decision to evacuate is almost always tied to a person's perception of risk, and that perception is shaped by people's past experiences. People who have lived in storm-prone regions for a long time and experienced many near misses may assume this next storm will be more of the same. In this case, said Rutgers' Cuite, officials often look for new ways of communicating the severity of the danger. That can mean instilling fear, like by going door to door and asking people to write their Social Security numbers on their arms so search teams can identify their bodies. Researchers are also working to develop new storm classification systems based not just on wind speed but on what kind of threats people will face and how big the threats will be. "A lot of people are creating visualizations on what 6 feet of storm surge looks like," Cuite said. "It's going to be over the average person's head." The Weather Channel featured one such visualization in the runup to Hurricane Florence. A newscaster stood in front of a screen that showed cars and debris floating by in the floodwaters. "If you scare some people too much, they are paralyzed by fear," Cuite said. "You have to pair the scary message with details on exactly what you need to do." "By and large, the vast majority of a population does have the ability to evacuate," said Brian Wolshon, who directs the Gulf Coast Center for Evacuation and Transportation Resiliency at Louisiana State University. But there are always people who can't, even if they want to. In New Orleans, it was estimated that as many as 30 percent of residents didn't have the ability to evacuate before Hurricane Katrina struck, Wolshon said. "The hospitalized, elderly, economically disadvantaged or prison populations," he said. A big challenge for these groups often is transportation. "There's been a lot of effort to see how can we use more routing transportation services and gear them toward moving people who can't move themselves," Wolshon said. "The problem is, from a practical perspective, there's very limited resources to be able to do that." Not surprisingly, Wolshon said, the regions that have suffered the most devastation are the ones that now have the best-developed evacuation plans: New Orleans, Houston, South Florida. "They've made the effort to make sure it doesn't happen again," he said. "The problem is trying to convince everyone else that it could happen in your city."